They don’t call it the Big Show for nothing. There were over 38,000 people in attendance from all over the world to talk retail, technology, strategy, and the future. 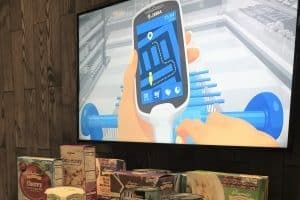 Here are four of the technology trends seen at the National Retail Federation Big Show that will impact retailing in 2019. 1. Amazon Go everywhere. The surge of self-checkout 2.0, pay and go, smart vending machine, and click and pick were everywhere. Cashier-less stores were the buzz. The successes and media attention that Amazon Go had created a frenzy of offerings. It is less about cashier-less stores and more about simple, fast, and seamless checkout for your customers. 2. Artificial intelligence (AI) was a common theme. Everywhere you turned, someone was discussing AI. From software that will solve all problems to robots designed to help customers, AI was the highlight. AI is starting to move from a buzzword into reality in all sectors of retail. There was more than one robot roaming the floor getting a lot of attention. The demand for computers to replace humans is here. AI will be a big part of retail in the next 18 to 24 months. AI, machine learning, and automation are not all about robots. These technologies are about mundane human tasks in retail being replaced with AI. 3. Radio frequency identification (RFID) was the talk of the town as well. 2019 may be the year of the RFID in the United States. The technology is proven and scalable. Nedap Retail launched a well-designed RFID platform to manage inventory while providing a seamless customer experience. Multiple vendors had self-checkouts offerings that were 100 percent RFID enabled. Many RFID manufactures were there to show off the new and improved tagging options. 4. Advanced use of video analytics. The next era of video analytics is here. From cameras that do everything in the edge, to tracking your customer traffic patterns, video analytics leveled up. There was a plethora of offerings related to video and consumer behavior. RetailNext’s in-store analytics was a standout. The ability to track a customer shopping pattern with a stereographic camera was out of this world. The Big Show can be overwhelming. I spent Monday and Tuesday walking the floor and meeting with folks. Man, did my feet hurt! I had to remind myself a few times not to get distracted by the numerous shiny objects and buzzwords. The four trends above signal the continued evolution and progression of retail. 2019 is going to be a great year for all of us. Featured image caption: Zebra Scan and Go technology.